Descemet membrane endothelial keratoplasty (DMEK) is the newest version of endothelial keratoplasty to treat swollen corneas as seen in Fuchs dystrophy, bullous keratopathy, and other causes of poor corneal endothelial function. 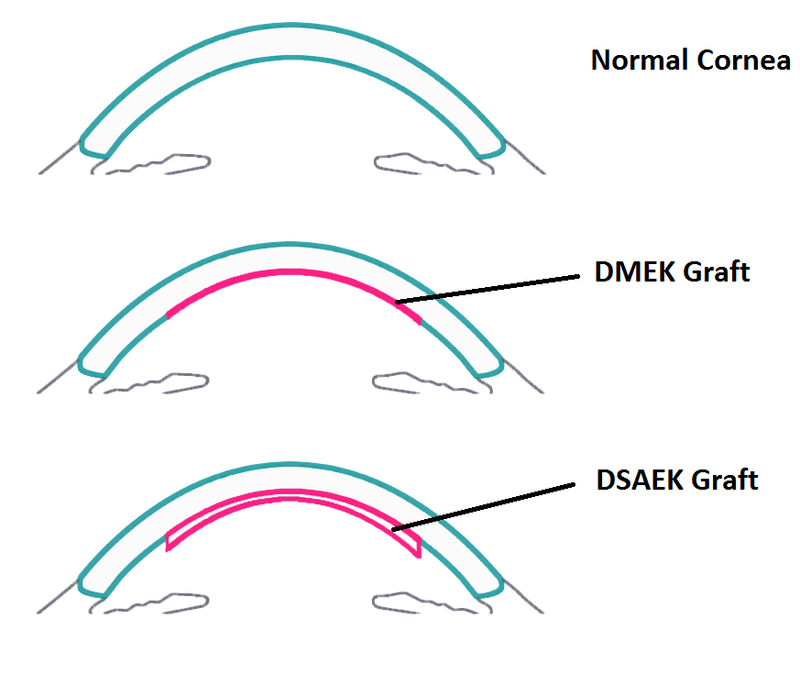 DMEK surgery provides the most anatomically exact replacement of the diseased layer of the cornea and leaves the patient’s cornea closer to its original condition more than any other corneal transplant technique. DMEK surgery is technically advanced and involves the transplantation of just one cell layer on a thin 15-20 micron thick membrane. What at the advantages of DMEK compared to standard corneal transplantation? - There is flexibility with the surgical plan as DMEK can be staged after cataract surgery, combined cataract surgery or done prior to cataract surgery depending on your age and lens/cataract. Your cornea surgeon will tell you what is best in your case. 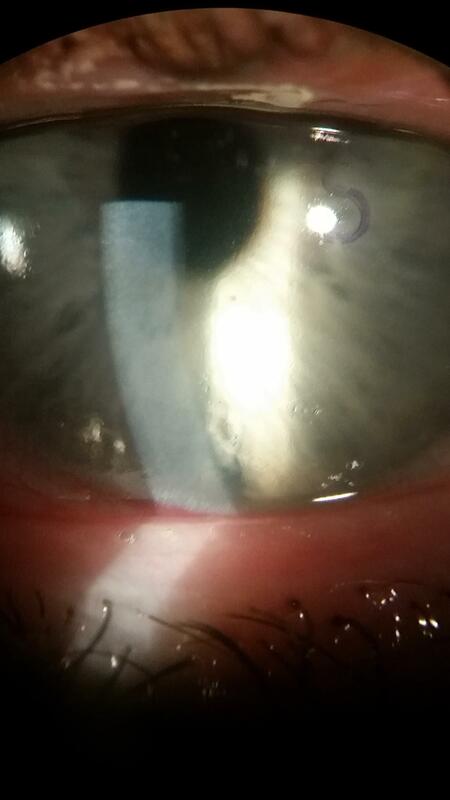 How is the thin corneal graft attach to my cornea? The tissue is so thin that sutures cannot be used to attach the graft. Instead a gas or air bubble is placed into the eye to gently float the graft into the upward correct position. That is why your corneal surgeon will have you position on your back with your eyes straight upwards after your surgery. Because gas floats above liquid, the gas pushes upward and allows your new cornea transplant to attach to the inner side of your own cornea. aucoma) that you would normally use on the same day as the surgery. The eye is patched and minimal discomfort should be experienced. Tylenol (acetaminophen) can be taken, as needed. As much as possible, you should lie down on your back, facing the ceiling for the first 24 hours. We require you not to look downward past eye level. You will see the doctor the same or the next day after your surgery. Your patch will be removed and your eye examined. You will be instructed on when to start an antibiotic and steroid drop to prevent infection and aid in healing. Your next appointment will be in approximately 1 week after surgery and usually in 3-4 weeks afterwards. Vision usually starts to recover by week 2-3 after surgery. Glasses are dispensed around 2-3 months after surgery once vision has completely stabilized. Click Here for more information on post-operative care for DSAEK and DMEK surgery. This can happen any time from the day after surgery to the week afterwards. After a week it is very rare to have a late detachment. If the cornea has a small detachment, your surgeon will replace additional air in the minor procedure room or clinic room to allow for better attachment. The need to replace additional air occurs in ~ 10-15% of DMEK surgeries. Usually once positioned with air, vision will be very blurry until the air is reabsorbed, afterwards vision is restored. If the cornea cannot be completely attach after 1-2 rebubblings, then your surgeon will replace your donor cornea with a new in the operating room several weeks later. For a video on the DMEK procedure, Click Here.